FREMONT, California: Tesla began delivering on a dream to make an electric car for the masses, rolling out the first of its keenly-awaited "Model 3" cars, aiming to disrupt a world accustomed to automobiles powered by pollution-spewing fossil fuel. An initial batch of the 'Model 3' cars that rolled out of the Tesla plant in Fremont, California late Friday was given to customers, most of whom were employees of the company. Tesla founder and chief, Elon Musk, proclaimed it a great day for the company, saying the goal was to make a terrific electric car "that everyone can buy." Musk starred in a ceremony at the plant delivering the first batch to their owners. "It's the best car for its cost, either electric or gasoline," he said. Production of the electric car aimed at the broader market - with a starting price of $35,000 - will ramp up quickly, according to Musk, with 100 in August and 1,500 or more in September. Tesla aims to produce 5,000 units of the Model 3 a week this year, and 10,000 units a week in 2018. Tesla already sells "S" and "X" model electric cars, but with a starting price of $80,000 they have been seen as wheels for the wealthy. The Model 3 silhouette resembles that of the Model S, but the new electric ride is smaller with a simpler design. 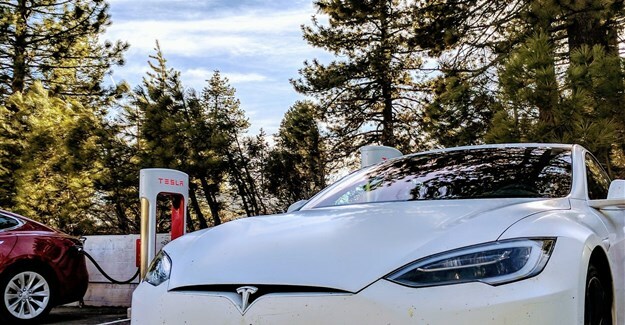 The vehicle's battery was designed to keep it going for "at least 215 miles" (345 kilometers) before needing to be recharged, according to Tesla. A battery with a longer range is available for more money. Musk has mentioned in Tesla earnings calls that while early models were packed with innovative engineering, they caused vexation on the assembly line. The Model 3, he said, was designed from the outset with mass production in mind to push down cost and crank cars out quickly. More than a half-million customers have placed deposits to get on the waiting list for the Model 3, and anyone wanting one will have to wait at least until 2018. "Demand is not a challenge there," Musk said, noting that most of the orders have been in the US. A big question for Tesla is whether it can ramp up production to meet demand and whether rivals will cut into the electric vehicle market. Like its predecessors, the Model 3 is fully electric and on-board computers can handle some driving tasks. Tesla referred to the arrival of the Model 3 as a "crucial step" in the company's mission to speed the transition to renewable energy. Cars powered by green energy are consistent with a concern for the environment seen in Musk's other enterprises. Musk runs solar energy firm SolarCity, and is building rechargeable batteries to power homes as well as cars. His Boring Company is part of a vision for near-supersonic rail travel through low-pressure tubes that he laid out in a Hyperloop white paper he made open to other entrepreneurs. Combined sales of Model S and Model X vehicles in the first half of this year were estimated to tally from 47,000 to 50,000. With the Model 3, Tesla hopes to start cranking out hundreds of thousands of cars annually. The success of the Model 3 could put in the rear-view mirror concerns about Tesla's prospects for growth. So far, Musk's strategy has paid off. Even though most major car makers sell electric vehicles, Tesla practically defines the category. The rush of pre-orders allowed Tesla to recently become the biggest US car company in terms of market capitalisation, despite the fact that General Motors (GM) and Ford produce millions of cars per year and Tesla has yet to make a profit. While Tesla is scrambling to meet Model 3 demand, GM has temporarily halted production of its 'Bolt' electric car to ease inventories. Some analysts say that with the launch, Tesla may be reshaping the future of the auto industry. Gene Munster, analyst with the research firm Loup Ventures, argues that Tesla may do for the auto sector what Apple did for smartphones and electronics. "We believe we will eventually look back at the launch of the Model 3 and compare it to the iPhone, which proved to be the catalyst for the shift to mobile computing," Munster said in a recent research note. Munster says Tesla will play a central role in "paradigm shifts" to electric and autonomous vehicles that could transform the sector.